Kids love to play pretend, and this Fire Truck Rider will take their imagination one step closer to reality. Constructed of heavy-duty polyethylene plastic built to withstand the outdoor environment. 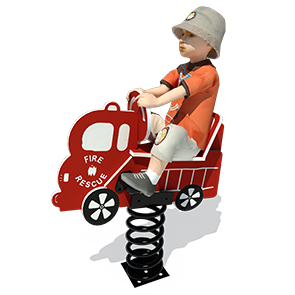 This fire truck rider is mounted on a heavy-duty, black powder-coated spring that can be surface mounted to concrete with J-bolts. Manufactured and tested in accordance with ASTM standards. Fire truck available in colors as shown only. 13' x 14' 10-1/2" Use Zone. The spring is powder-coated with a triple flo-coated corrosion protection for a superior, high gloss, no peel, no flake finish.